“John” is a 44 year old male who presented to my office with a year long history of Achilles tendonitis. 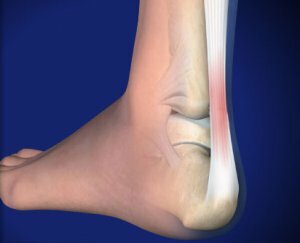 He had been evaluated and treated by a previous orthopedic surgeon with the use of custom orthotics and stretching exercises. His pain had never resolved. He is novice runner averaging about 10 to 15 miles a week and the pain was more associated with his running. He would improve if he took a break from running, but as soon as he returned the achilles became inflamed and painful again. John was frustrated because he was wearing the “best” shoes he could find and changed them every 3 months and was wearing his custom orthotics. The pain would not resolve and was worsening over the course of a year. Upon evaluating John, he was unsure of his “foot strike” but really thought he was a heel striker because he focused on landing on his heel and rolling lateral before toe off as he had seen described years ago in “Runner’s World.” He concentrated on doing this more when his pain was worse. I then advised that most likely his pain is secondary to his form, and was really irrelevant of his shoe gear. His orthotics were also very unnecessary given his normal arch and absence of a osseous deformity. After 6 weeks of working changing his foot strike, increasing his cadence, and strengthening his lower extremity musculature, John is now 90% better and is running 10 miles a week. He is going to run a 4 mile race on Independence Day with a goal of 8:00 miles. John continues to run in his traditional running shoes but is considering a switch to a more minimal shoe given what he has experienced by changing his form thus far. This is one of the many runners we have helped by focusing on form, as opposed to shoe gear or orthotics. We have relied so much on shoes in the past that we sometimes forget about our form when it comes to running. If we let our feet function as they were designed, the rest of the body can also function properly thus minimizing injury.